As for the Junior Women, it was a wetsuit swim for the Junior Men. 51 athletes lined up with the fanfare music echoing along the beach. The introductions over and the heartbeats now focussed everyone’s attention. A run down the beach, a few metres of wading before the dolphin moves and then, with deeper water, the real work begins. It was an “enthusiastic start” that sent the officials back to their video equipment as some of the less-experienced athletes got “twitchy feet” as they heard “take your marks”. Coming out of the water and ten athletes made it to T1, speeding through to get out onto the bike. With these 10 doing their best to break away and with the Italians, Davide Ingrilli and Alessio Crociani in that group, along with Levente Karai and the determined Spanish athletes, the group of 10 were flying. Paul Völker GER, Igor Bellido Mikhailova ESP with teammates, Jesús Jiménez Gimeno, Iñaki Candel Bermudo, Angel Sánchez Carreras, Juan José Montoro López and Sergio Baxter Cabrera, pushed hard to establish an early lead of 40 seconds. This lead, now with the pack down to 9, extended to over a minute, with Bellido dropping back spectacularly. A breakaway from Baxter gave him a 15 second lead. Crociani and Völker chased with Jiménez, Karai and then Sánchez and Ingrilli following. As the pace increased, so it got tougher in the group and Montoro began to struggle. The attacks split the group and suddenly the run was underway, with Baxter leading them out onto the run. It was Crociani who then surged ahead, pulling Karai with him. The Italian kept the pressure up and created a lead of 10 seconds. Could this be the signal that Italy was going for the double? Behind him, Sánchez and Baxter were having their own battle. Ingrilli was losing contact and the battle for silver and bronze was on. Crociani kept the gas on and pulled away. The 10 seconds lead grew to nearly 20 in no time at all and Crociani was now running with one thing in mind – GOLD. He held onto his lead, taking in the glory on the blue carpet as he ran towards the finish tape. Italy had done the double and his gold medal was secure. Behind him, Karai managed to claim silver ahead of Sánchez but it was a really close call with Baxter just losing out after the finish camera had been checked, checked again and then, just to make sure, checked once more. An amazing day for the young Italian team. We hope to get some feedback from the athletes themselves later this evening but for the moment, Alessandro Bottoni, Technical Director for Youth in FITRI, said, “This result is a wonderful one for our federation and for the sport. 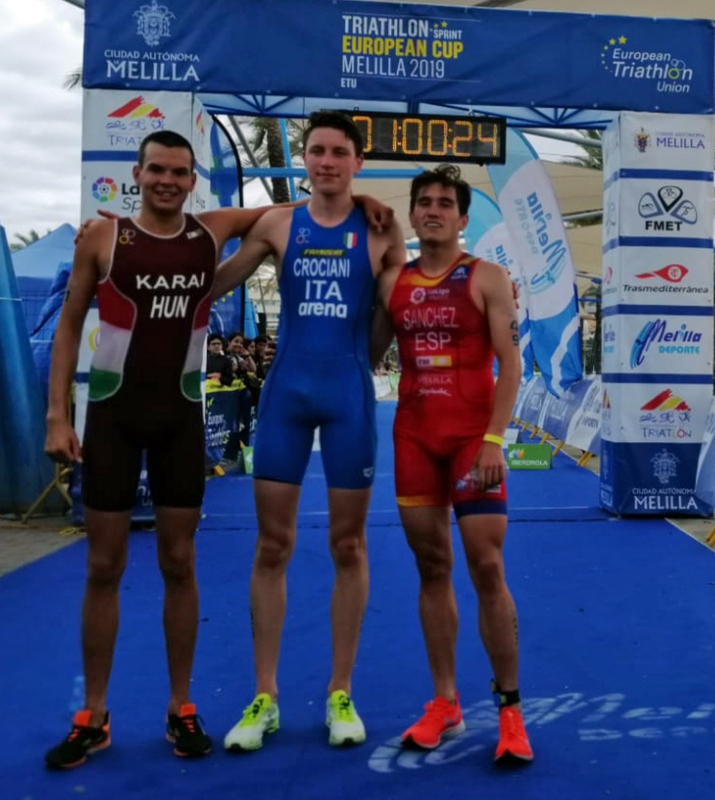 It sends out a great message to our younger athletes and I hope it will inspire many more to join in with us to make Italian triathlon bigger and better.